Below you can view all the homes for sale in the Stoneridge subdivision located in Greenwood Indiana. 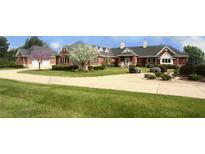 Listings in Stoneridge are updated daily from data we receive from the Indianapolis multiple listing service. To learn more about any of these homes or to receive custom notifications when a new property is listed for sale in Stoneridge, give us a call at 317-308-8198.
garage, 3+ car heated detach garage, security system, irrigation system, wine cellar, sound proof music room & more. See flier for more details. MLS#21618144. Mike Watkins Real Estate Group. Breathtaking Majestic Manor*6+ Acres In Gated Community*circular Drive*exquisite Custom Detail*impeccable Luxury Amenities*elaborate Entry*grand Great Room*equipped Master Bar*formal Dining*gourmet Kitchen with granite, Center Island, Breakfast Bar, Walk-in & Butler Pantry, Top Of The Line Appliances, Breakfast Nook*formal Living Room Or In-law Suite*theater Room*exercise/Dance Studio*office*two Stunning Master Suites With Whirlpool Tubs, Steam Showers, Double Sinks, Generous Closets*two Fireplaces*detailed Built-ins*abundance Of Natural Light*20 Ft Ceilings*elevator*4 Car Attached Garage with custom Cabinets*60 X 66 Detached W/Kitchenette & Bath*rv Storage*relax On Upper Deck*stocked Pond With Lighted Fountain. MLS#21612036. RE/MAX Real Estate Prof.